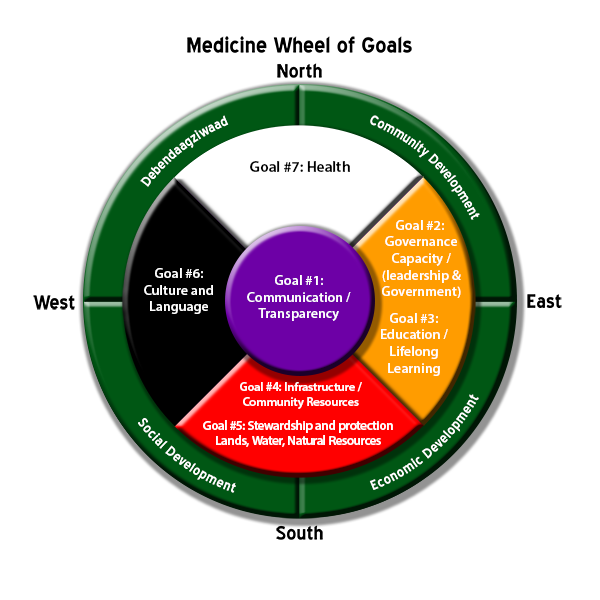 Our Strategic Plan is reflected in the Medicine Wheel of Goals below. Every department develops an annual work plan that identifies the strategies, actions and tactics they will use to accomplish the goals that are represented within one or more of the four main quadrants. The outer rings (green) illustrate the four key pillars that drive the work we do: Debendaagziwaad (the Nipissing People), Community Development, Economic Development and Social Development. Communication/Transparency is at the centre of the medicine wheel because we strive to be accountable to our Debendaagziwaad about what we are working on and how we plan to accomplish our goals.